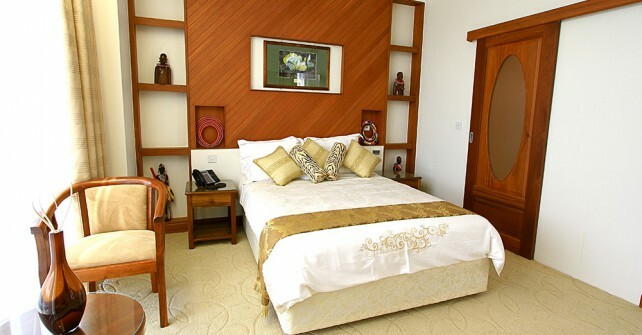 The Standard rooms provided by The Palace Hotel, Arusha are ideal for the Business traveller who is looking for comfort, convenience and affordability. The demands of a Business traveller are met with a Business Centre providing Wifi and other secretarial services from a scenic location within the hotel. A fully air-conditioned area in which to work or relax at the end of a long day’s business. Satellite Television is provided – ensuring you keep up to date with world affairs. An electronic safe deposit box affords you peace of mind – as you can lock up your valuables as you go about your business outside The Palace Hotel. A Mini bar is situated in your room – for which you can request stocks to suit your tastes from room service. The en suite bathrooms provide not only excellent personal comfort but also have a fixed dryer to afford you some time saving when you have a meeting to attend. When faced with a hectic schedule, what more could the busy business traveller require than the appointments of The Palace Hotel Standard room – and the support services on offer within the hotel.